Forget Thanos and Avengers: Endgame, Iron Man/Tony Stark is having a tough time fending off Joker aka Clown Prince of Crime! Now, you must be thinking why on the earth is Marvel hero fighting DC's supervillain. Well, that's exactly what Google India meant when they tweeted 'Crossovers are no joke.' This week was quite exciting in terms of trending topics. On one hand, we had Robert Downey, Jr born on April 4, 1965, turned 54 years this week and on the other hand, the teaser trailer of JOKER, starring Joaquin Phoenix as the Joker released. And of course, with the month beginning with April Fools' Day on the first of April, netizens had a blast enjoying the top trends. It is no hidden fact that Marvel and DC enjoy a crazy fan-following across the globe. The much-awaited trailer of Joker released on April 3 and continues to dominate trends with over 2 million views on YouTube. And on April 4, it was 'Marvel' man aka Robert's birthday. As the Hollywood biggie turned a year older, social media was filled with birthday messages to the actor making the event one of the biggest Google trends. Joker Movie Trailer: Did You Spot ‘Batman’ in Joaquin Phoenix’s Film? Google India couldn't stop but look at the big clash that DC and Marvel fans did not (witness). 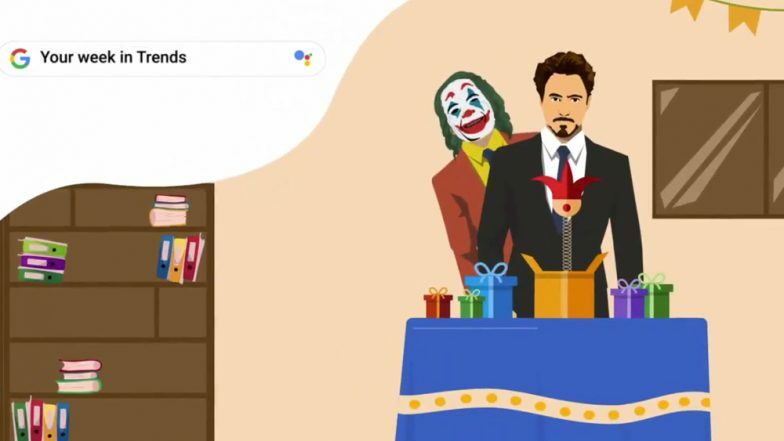 Making the clash even more visible, Google shared a GIF showing Marvel's Iron Man falling for DC's Supervillain's April Fools' Day prank. The GIF shows Robert Downey, Jr opening a gift box to bring out the Joker played by Joaquin Phoenix and that says it all! Tweeting about the biggest Google trends this week other than April Fools 2019, Google India wrote, "Crossovers are no joke. #GoogleTrends @RobertDowneyJr #AprilFools @jokermovie #JokerMovie." Robert Downey Jr Birthday Special: 5 Reasons Why It Is Impossible to Recast the Iron Man of Our Generation Any Time Soon! The first trailer of Joker showed both happy and dark side of a potentially intriguing story. In the upcoming movie, Joaquin Phoenix brings one of the most iconic villains of this generation to life spectacularly. The trailer shows the life of Arthur Fleck from being a small-time stand-up comedian to a full-blown criminal and the circumstances that led to it. The movie is set to release on October 4, 2019.